This mod is very simple. All it does is change the title of the Minecraft window. The text it sets the title to it gets from the configuration file. Just launch the game once to generate the default config, and edit to fit your needs. There are a few replaceable inputs, too. If you have any suggestions for the mod, feel free to submit an issue in the issue tracker, and I'll see what I can do. will there be a 1.13.2 version ?? Pls do an 1.8.9 version.. please! 1.13 version in the works? 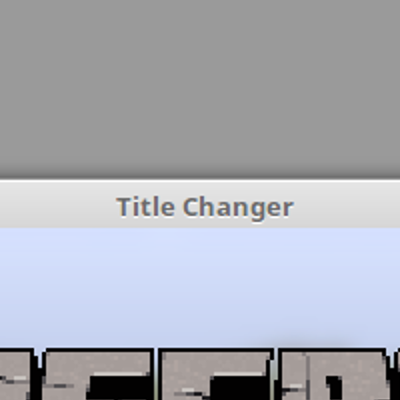 Title Changer 1.1.3 has been released, which adds support for 1.12.2. As I said in response to the GitHub issue you opened, there will not be a 1.8.9 backport in the foreseeable future. I can't believe this didn't existed earlier. For those wondering if it works with Discord so you can give the game different names (i.e. "Playing MC 1.10", etc.) depending which version instance you're playing, it changes the WINDOW TITLE and not the FILENAME, so Discord will still think it's the same program. Huh, I didn't know that Discord detected the name that way. That's unfortunate. Discord was one of the reasons I made the mod in the first place. And unfortunately, some graphics drivers detect the file name when deciding which optimizations to use, so changing the file name is out of the question too. Thanks for the notice, though.